No operator of any aerial adventure wants guests to be hanging by a thread, figuratively speaking. 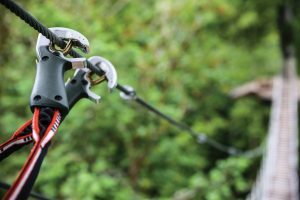 Belay systems—keeping aerial adventure participants securely attached to a lifeline to prevent injurious falls—are essential for reducing or even controlling risk when guests are up in the air. There are many belay systems now on the market. And while safety is obviously the overwhelming consideration in choosing any belay system, other factors also matter: smooth operation, ease of use, traffic volume, park design (and features involved), staffing needs, cost, maintenance, etc. Superimpose those variables on the many belay products currently on the market, and the choice can become confounding. The last decade has seen a major step forward in belay designs as commercial adventure parks have proliferated. Belay systems were once simply mountaineering (or sometimes industrial) gear adapted for use in adventure parks. Now, systems are designed specifically with the needs of adventure parks in mind. “It is the Europeans who took up the ball,” says Gerhard Komenda, president of Adventure Park Gear, the U.S. distributor of the Edelrid belay system. No surprise there—Europe, with its alpinist tradition, is where the whole concept of belay was born and evolved, and aerial parks have existed for decades. But North American distribution has become widespread in the last five years. For starters, belay products for the adventure-park market can be easily bifurcated into smart belays and continuous belays, although there can be some semantic overlap here. For the purposes of this article, we define smart belays as systems employing two lanyards attached to the lifeline. When either lanyard is detached from the lifeline, the other is securely locked, to assure that the user is always attached. Continuous belays generally employ a single lanyard that is always attached to the lifeline except at specific terminals. Typically, the means of attachment is a trolley or a carabiner-like hook. Proponents of continuous belay systems emphasize the simplicity of the concept. Clip onto the lifeline at the beginning of a tour, clip off at the end. They also argue that this simplicity can shorten pre-tour instructions—what Jacques Christinet, owner and CEO of Kanopeo calls “economy of instruction”—and that less time spent explaining the operation of the belay device also improves traffic flow. Proponents of smart belay systems tout the versatility of being able to switch easily from one course feature to another, or for faster travelers to navigate around slower movers virtually anywhere on a course. Also, smart belay systems require some manipulation by the user, and proponents contend that users enjoy being more actively involved in the belay process. But assuring absolute safety may ultimately and forever be a work-in-progress. A design deficiency might only become apparent after some unforeseen incident in the field, possibly after a device has already seen extensive use. Such was the case in a strangulation incident involving a dual-lanyard smart belay system a few years ago. The industry responded quickly, with belay manufacturers inspecting their designs to determine what modifications might prevent a similar incident from recurring. 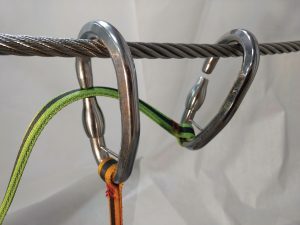 One response was to lengthen one of the lanyards on a smart belay design so that if a user fell, only one lanyard would be taut, while the other would hang loosely, preventing the two lines from tightening and twisting together. Edelrid’s system already had what Komenda calls a “pilot bar,” a six-inch-wide handhold between the two lanyards that effectively prevented the two lines from twisting together. Continuous belay systems, based on single-lanyard designs, have posed less of a strangulation risk. Nevertheless, the aforementioned incident motivated continuous belay companies to review their designs and redouble their emphasis on safety. 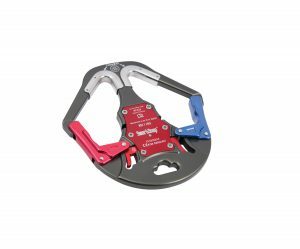 Mike Holder, founder of Adventure Park Systems, the U.S. distributor of Vertical Trek’s QuickTrekker continuous belay, says the company ran the QuickTrekker through a number of trial runs. “We found no scenario that we could reproduce that would turn out that result,” says Holder, referring to a strangulation possibility. Here’s a look at what’s currently on the market. The CliC-iT smart belay system has a dual lanyard with locking carabiners that communicate with each other: when one is open, the other locks so guests cannot disengage from the lifeline. Two lanyards connect to the lifeline with locking carabiners that “communicate” with each other via a cable that runs along the lanyards. When one carabiner is open, the cable forces the other one to lock. CliC-iT touts its adaptability to existing park layouts, since the system is compatible with virtually any cable or cable height. It can also work on vertical elements by use of cable loops, or on auto-belay devices and zip lines as steep as 35 degrees. Because the system relies on mechanical technology to assure that the carabiner locks open and close properly, wear and maintenance are inherent. Bruser says CliC-iT teaches its clients about yearly inspection and maintenance, and says that all parts are replaceable. Because the product is still relatively young, its long-term durability has yet to be fully determined. That is true, however, of most of the mechanical belay systems on the market. Edelrid’s smart belay features a pulley on each locking carabiner to smooth the interface between belay and lifeline, which also allows for easy transfer from the lifeline to a zip line without the need for an additional trolley device. The minor modifications in the last couple of years to Edelrid’s smart belay, according to Komenda, have been aimed at extending longevity. 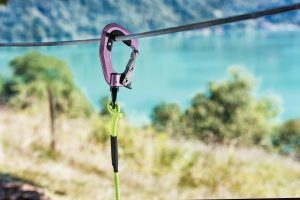 The Edelrid smart belay is what Komenda calls “a pure mechanical device,” with gears and springs that pull levers to move a cable connecting the two carabiners. Within each carabiner is a pulley to smooth out the interface between belay and lifeline. Ergo, a lot of moving parts. Edelrid has two U.S. service centers—one in New York and another in Rhode Island—to provide annual service. If not used and stored properly, the devices can be susceptible to problems caused by such impurities as dirt and mud. On the plus side, Edelrid’s smart belay designs and its integrated pulleys mean “one system fits every attraction in your park,” according to Komenda. Most notably, that means an ability to transfer to a zip line without requiring another trolley device (although a zip line on which speeds might exceed 50 miles per hour “could overcook the pulleys,” says Komenda). Devices called tweezles (above, red) lock and unlock the carabiners on the Bornack Safe Link SSB smart belay system, allowing guests to only attach to the lifeline and not to staff shortcuts or guy wires, improving safety and keeping guests on track. According to Azarm, the market acceptance of Bornack’s Safe Link SSB has been impressive; “probably 30 percent of all parks are using SSBs,” he says. One reason, though certainly not the deciding one, is Bornack’s appealing New World nomenclature. Until the Safe Link SSB came along, who had ever heard of such a thing as a tweezle? Tweezles are essentially magnetic keys along a lifeline route that lock and unlock the carabiners on the dual-lanyard design. The use of the tweezles allows a park “to guide clients to where you’d like them to go,” says Azarm. The tweezles prevent guests from clipping onto lines, such as staff shortcuts or structural guy wires, where you don’t want them to go. The Safe Link SSB, however, has no integrated pulleys, and requires an additional trolley for use on a zip line. As with the CliC-iT and Edelrid designs, the SSB operates mechanically, meaning service and maintenance are necessary. Bornack trains park personnel to perform minor repairs, says Azarm, but the devices require a checkup once a year at one of Bornack’s service centers. The Saferoller continuous belay from Kanopeo is a trolley system with two pulleys that roll smoothly on the lifeline. It’s easy to use, requiring no user input, which makes it ideal for kids’ aerial courses. Kanopeo’s Speedrunner continuous belay system features a single carabiner-style hook as the lifeline attachment to a single lanyard. Kanopeo makes two continuous belay systems: the Saferoller trolley system and the Speedrunner clip system. The Saferoller is far more popular, according to Christinet. 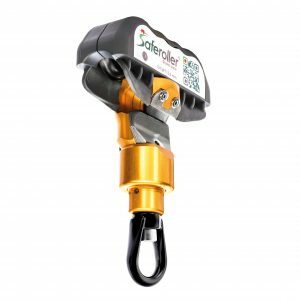 While the lifeline-connecting device for the Speedrunner is a carabiner-style hook, the Saferoller incorporates a trolley with two pulleys made of either Teflon or stainless steel. Smoothness and simplicity of use for guests are its selling points. Astried Hubner, Kanopeo’s marketing and communications manager, says it works well on kids courses because no manipulation is required by the user. However, the Saferoller requires that the lifeline be 2.0 to 2.3 meters (about 6.5-7 feet) above platform height, meaning that retrofitting an existing park to make sure lifelines meet design parameters can be laborious and costly. “Saferoller is very good when you can plan it from the beginning,” says Christinet. The Speedrunner is a more feasible retrofit. 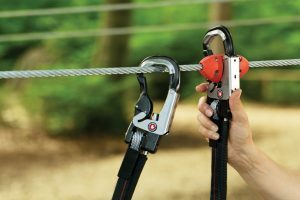 The Roperoller continuous belay system from -on-the-ropes- has two steel cable rollers fitted with either ball or bush bearings, depending on the application. The Roperoller continuous belay system, manufactured in Germany by -on-the-ropes-, is a versitile system with profiles designed to attach to different structures: the newly-designed pole profile attaches with bolts, the newly-designed tree profile attaches with either steel or synthetic tension belts, and clamps connect it to steel beams. It can be used in adventure parks, high ropes courses, canopy tours, and other structures, including buildings. The Roperoller’s shuttle has two cable rollers made of hardened stainless steel designed to allow the shuttle to stay on track and travel smoothly. The rollers can be fitted with either bush bearings or ball bearings, depending on the application, including zip lines. The shuttle’s opening mechanism can be closed by either a triple-lock carabiner or a rapid link. The company also introduced a new switch mechanism. Participants are attached with an adjustable lanyard. All bolt attachments, tension belts, and clamp connections are certified by DEKRA, a German inspection institute that tests and certifies the safety of manufactured goods. The QuickTrekker Seven hook continuous belay is designed to be durable, easy and inexpensive to maintain, and easy to use on the course. 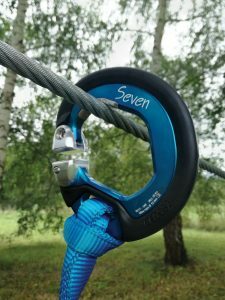 Vertical Trek designed its QuickTrekker Seven hook, which resembles a carabiner, with a small opening on the side, smaller that the diameter of the lifeline cable, that allows the hook to slide over tree- or platform-mounted plates to transfer from one feature or route to another. Holder touts the durability of the hooks, which he says “last for a very long time.” In part, that’s due to durable sleeves that are inserted on the upper part of the hook, where it makes contact with the cable. These sleeves must be replaced from time to time. Nevertheless, one of the selling points of the QuickTrekker is that, with no intricate mechanisms involved, maintenance—and hence, the cost of maintenance—is relatively minimal. One potential disadvantage of a continuous belay system is that it can make passing slower travelers on course an issue. Holder says this problem can be resolved more in the design of a park rather than in the design of a belay system. In parks where a QuickTrekker system is installed, he says, slower travelers can pull over at “periodic rest areas” and allow speedier travelers to pass. Simplicity of design and the abililty to maintain continuity with vertical and detached features (with the help of a Connect 2.0) are hallmarks of Coudou Pro’s Zaza series of continuous belay hooks. Coudou Pro’s Zaza 2 hooks (or lighter Zaza 1 hooks for kids’ courses) employ a design similar to the QuickTrekker, in that the Zaza hooks have an opening on one side that is smaller than the cable diameter. The design is exceptionally simple. “There are no mechanical parts,” says Kenny Brolin, manager of tech sales for Kong, Coudou’s U.S. distributor. “It’s just a bent piece of metal.” Also like the QuickTrekker, the openings in the Zaza hooks can slide over various plates designed to move around obstacles or to transfer from one tour element to another. One of the challenges for continuous belay designers has been to come up with a method to maintain continuity through vertical features or detached features such as rope swings. 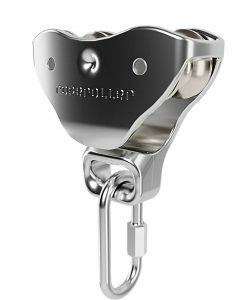 Coudou has addressed this issue with its Connect 2.0, an interlocking device that allows a Zaza hook to slide from a horizontal lifeline to a swing or vertical lifeline when the Connect 2.0 is locked, then safely switch to the new lifeline when the interlocking components are disengaged. Koala’s Pouliz 2.0 continuous belay system is a dual-pulley trolley with double, asymmetrical lanyards. (The kids’ design has a single lanyard.) While potential wear and tear on the pulleys might concern some park operators, Laurent Comte, Koala’s director of sales, cites one example of a course employing the Pouliz 2.0 that hosts 100,000 visitors a year, and has had to replace only two or three pulleys. Regardless, says Comte, Koala charges no maintenance fee. 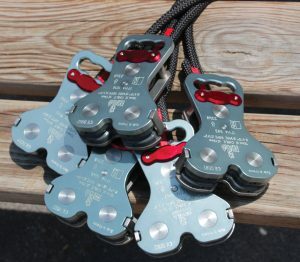 Comte claims that the Pouliz 2.0 is “the only [continuous belay trolley]that works for both horizontal and vertical activities.” Other continuous belay systems, of course, incorporate ways of going from horizontal to vertical and back, but Koala achieves it through transfer stations, where the trolley locks into the station before transferring to the vertical lifeline. The SmartSnap from ISC is a hybrid of a continuous belay and a smart belay system, featuring a single connecting device and single lanyard with a dual locking mechanism. Is ISC’s SmartSnap a continuous belay or a smart belay? In fact, although billed as a “continuous attachment system,” it is a bit of a hybrid. It combines a single connecting device and single lanyard with the dual, locking openings of a smart belay system (see photo, p. 49). The connecting device looks a bit like two carabiners molded back to back. As in any smart belay system, when the gate to one side is opened, the gate to the other is automatically locked. The locking and unlocking is achieved at designated transfer points along a course, where “ring locks”—metal rings from which metal pins extend—allow the user to transfer and lock onto a new lifeline before unlocking from the preceding lifeline. The connection is achieved by inserting the pin into a hole on the device, unlocking one gate while the other remains closed. That process might seem cumbersome to some users, but in practice it is similar to other smart belay systems. And, like other smart belay manufacturers, ISC believes there are many adventure park visitors who enjoy being actively engaged in the belay process.